Richard Branson’s pioneering commercial spaceline, Virgin Galactic, has its first official partner. Announced aboard the USS Intrepid, the partnership will see Land Rover vehicles become part of daily life for the Virgin Galactic team and for all ‘Future Astronauts’. According to the release, "the space experience will now begin with Land Rover as they arrive in New Mexico for training, and continue to the moment they drive from the space terminal building to the waiting spaceship." 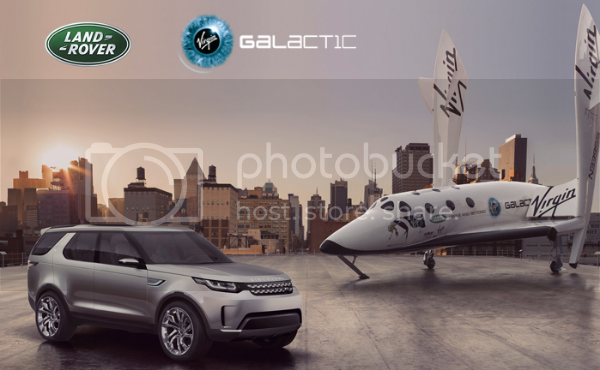 Land Rover will base a fleet of vehicles at the Virgin Galactic test centre in the Mojave Desert, California and at its operational New Mexico base, Spaceport America. “This is a marriage of two of Britain’s most iconic brands which celebrate shared values, a pioneering spirit and a true sense of adventure," Phil Popham, Group Marketing Director of Jaguar Land Rover remarked. "Not only do we both share the same long-term vision to enable mankind to explore, but we also want to develop this partnership to inspire others. From our tens of thousands of employees and customers to schools and colleges, motivating more young people to pursue careers in engineering, science, technology and math – and explore new ways of travelling for future generations."